Those of us trapped in a seventh-grade humor level will find the toilet “totally wicked.” Jokes about dropping the kids off at the pool aside, the toilet is part of a bigger exhibit called ExploraHouse. Opportunities to learn about electricity, plumbing, insulation, and infrared technology are as much a bonus as watching your kids flush down a PVC “slide” into the basement one story below. A motion detector senses when any matter passes through the bowl , and a recorded flushing noise adds to experience. Before we could find them, the kids were up and re-flushing themselves over and over again. Honestly, though, you really got the feeling Mr. Clean would come to the rescue before anyone hitched a longer ride on the Porcelain Express. Because the toilet was housed in an otherwise awesome Children’s Museum, you could easily spend an hour or two burning off steam and then finding nearby spot to dine in the quaint downtown. If you have teenagers or want to find an easy-on, easy-off photo opportunity, other Roadside America options were plentiful up and down that stretch of interstate corridor. Maybe even find the world’s largest toilet plunger or toilet paper roll? Referencing the aforementioned seventh-grade humor level, I say “ 8 or 9” and double thumbs up. I love such quirky roadside stops, too! Thanks Traci, @Dominique (laughing really hard about the “go big” comment) We did eventually find a real pool to drop the kids of later on at our hotel. What a fun opportunity to guest blog. Thanks again! This is hilarious. Go Big, Everyone! My advice is to do this at the end of the trip so the potty humor doesn’t last two weeks. 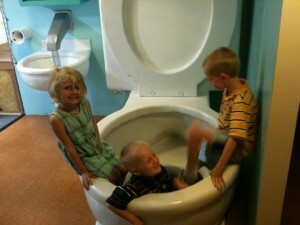 Nothing like telling the kids to be good or they can’t see the toilet. World’s Largest Toilet….that was unexpected. Fun guest post. Thanks for the laugh on a Friday. Thanks for stopping by to say “hi!” Isn’t Roadside America great? Such an informative resource!